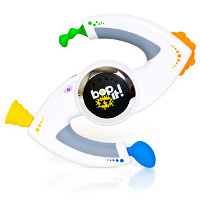 Remember the original Bop It! game? Well, the Bop It! XT which retails for £27.99 intends to add more depth to what was already a fun activity. Basically, this “game” is extremely addictive as it involves the follow-the-leader-style, requiring players to manipulate a rather wacky selection of extremities within a particular time frame, where they are timed to an ever increasing musical cacophony. With Bop It! XT, the situation has spiced up to a whole new level, where half a dozen more commands are thrown into an already frantic mix, including the all new shake function. Add that to bopping, twisting, flicking, pulling and spinning, and you might just throw this against the wall out of frustration than anything else.